Steph's Snack Shack: St. Patty's Day! Around Christmas, I saw my grandparents and they mentioned that they wanted to come up and see the house - since they haven't been over since our housewarming party. I thought it was a great idea and decided to invite them up for St. Patty's Day so I could make my reuben recipe (it's been about just as long since I've made that). Tastes best if you make it the day before you serve. Also, it will be pretty spicy if you taste it alone, but the heat goes away when you eat it on the sandwich. If you don't want to use Russian dressing you can use Thousand Island dressing. Basically follow the directions on the package, but here is what I did. Put the entire roast in a large pot (I used a dutch oven). Toss in 2 bay leaves. Pour in 12-16 oz beer. Pour in enough water to cover the roast (I ended up using maybe about 12 cups). Cover pot, bring the liquid to a boil, and then turn down to a simmer (you might need to tip or remove the lid to keep the liquid from boiling again). Simmer for about 3-4 hours or until the meat is fork tender. When the meat is done, pull from the pot and place on a cutting board and let rest before slicing. If you are not ready to assemble the sandwiches, tent the meat with foil to keep it warm. Place a full layer of beef on the bottom of the sandwich. Lay down a layer for the kraut on top of the beef. Place a slice or two of cheese on top. On a frying pan or flat griddle, grill the sandwich like you would a grilled cheese. 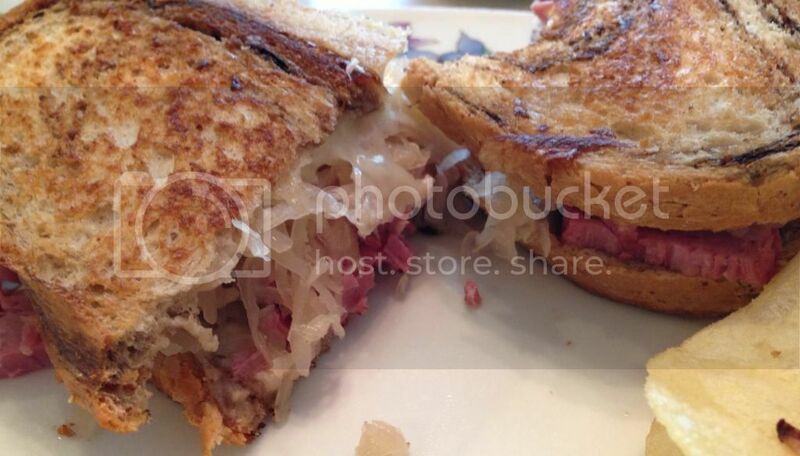 Be careful when you flip the sandwich; it's easy to send beef and kraut flying out the sides! Once again, I know this looks like a lot of steps, but it's really pretty easy! If you make the dressing the day before (which is best anyways), on the day you want to make the sandwiches you just put the corned beef on the stove and it does all the work! The only "hard" part was assembling the sandwiches and frying them efficiently enough so everyone ate around the same time. But it's sooo worth it!